Does anybody know if this works instead? If I still need to add the codes, the second code is not working, is there an update to it or something ? will it show me the current status of my blind, shutter if I used the remote? is there a stop button? Hey guys, does anbody know if you can now the current state of the blind or awning ( if its 50%, open or closed) with tahoma box or anythings else? I mean, it seems you dont know the current state of the blind with the zrtsi bridge but maybe there is another option? 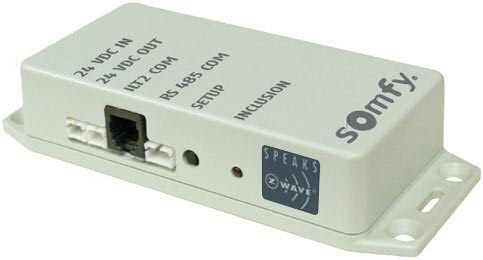 I live in europe and somfy dosent sell here the zrtsi bridge, also even if i buy it there it probably wont work because of z-wave frequency. they sell a usb key dongle thats its meant to connect to tahoma box, anyone tried that? I don’t think so because the Somfy RTS motors don’t really send/reply to any commands. It only receives so it would be down to the device sending the command to keep track of the last position; which can be wrong if the blinds or shades were controlled manually. It is possible for IO blinds, not for RTS. The TaHoma® by Somfy integration I made for TaHoma handles position for IO blinds. It is a cloud to cloud integration, doesn’t require additional hardware. Hello, i recently installed somfy zwave shades. in smartthings, there is a round green battery icon. Does this accurately measure battery life remaining? how do i get the shades to show up in my google home app so i can control them by voice? I have it working now but through a complex work around (had to set up a virtual switch in smartthings that is mirrored to shades. The shades don’t show up in google home but the virtual switch and my other zwave switches do). The work around is fine but using this method i can’t use google home to set them to a percentage open/closed - only all the way open or all the way closed. Also to get them to show up in Google Home you need to go into the IDE to switch the device type to a dimmer switch. Ok, thanks for the tips!! Anyone been successful using homebridge to control the Somfy / Graber blinds? I installed homebridge on a Raspberry Pi and I used a Smartthings device handler to load everything that was in Smartthings … it treats them all like a dimmer, which is fine, but I can only seem to get the blinds to go up, not down. Curious if others have had any luck and which handler you are using in both ST and homebridge. Hey Eric, for the z-wave shades it’s better to ask on this thread, also which DH are you using? I created both device handlers for zrtsii and shades but i really don’t understand the next step? Just put the Zrtsii into including mode and look for devices in ST app? Does it need to be very close to the hub? My Somfy blinds stopped responding to ST. They were working fine after the latest new UI app update a few days ago. So I am not suspecting it is because of the app. I have restarted the ZRSTII, restarted the ST hub and no luck. Any ideas on how to troubleshoot. This has been working fine for the past 3 years. Check your IDE to see if the ZRTSI is receiving the commands from the hub and responding at all. It could just be the ZRTSI fell out of the z-wave network. From the app, it shows like it is disconnected sometimes and sometimes is ok.
Another questions is, my Controller is using a Type: Z-Wave Controller. Is this correct? That is what I have been using for years. UPDATE: End it up excluding virtual devices then controller, re-adding them, copying the smartapps from previous devices to new devices, issuing a discovery in Alexa and changing any actions in Alex and tasker to reflect new devices. Let me know if this should be in another thread. My configuration is: Somfy roller blinds, MyLink Tablet Interface/WiFi, Davis Vantage Vue using Meteobridge, legacy SmartThings. I can control the blinds with SmartThings and have a custom device handler working with the Meteobridge (Davis Vantage). I’ve set up a test automation where I turn on a light based on an illuminance value from the Davis. The use case I want to put together is: Based on the illuminance lower the shades, I’d also like to add other variables like wind but would be happy to just get them to go down. If possible I’d like to avoid IFTTT webcore is something would consider but don’t have a clue how to control the up or down only on and off. Any thoughts? I have two Somfy RTS remotes (a blue and gray if that matters) that control two outdoor awnings. I would like some advice, would the zWave RTDII module work best for my setup or is there another device you guys suggest?